Buying a farm with two months of vague farming experience is not the traditional way to pursue a career in agriculture. Neither is making the transition from art professor to farmer, but Erin Stack has managed to successfully transform a plot of earth into New Harmony Farm, which will enter its second full growing season this spring. “I’ve always been an artist and a lover of science,” Erin says, and her experiences in creating and developing her farm, while untraditional, are a testament to the pursuit of a lifelong passion. 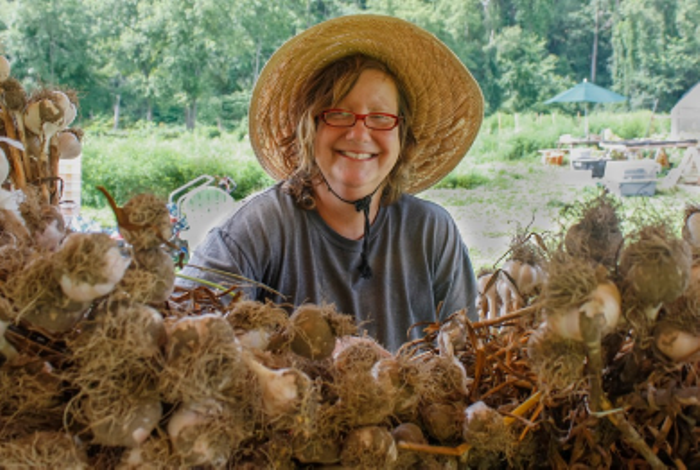 Erin runs New Harmony Farm in Essex County, a 4,500 square foot plot of land that she originally bought with two months of prior farming practice. She knew she had jumped in well past her comfort zone, but was eager to get her project off the ground. Erin heard about New Entry through a couple of her friends who were farming mentors and enrolled in the Farm Business Planning Course. She says one of the most valuable things she learned from her collaboration with New Entry was how to use spreadsheets to effectively plan out the growing season, saving her a great deal of time and effort. She also says the program helped her learn how to be more organized when it came to running her farm and helped her to confidently use farming equipment like tractors, something she had never operated before or even thought of in the context of farming. These days, Erin has chickens and bees to go along with her vegetables, and is very excited about having a couple sets of hands besides her own to help her. Erin has also become much more involved in the practice of biological and ecological farming, paying special attention to the soil in which her plants grow. Erin is doing her part to help aid in this problem, going a step further than organic farming by growing nutrient dense vegetables. These veggies contain higher amounts of vitamins and minerals thanks to improved soil chemistry. Erin has also been attending the Northeast Organic Farming Association’s soil and nutrition conferences. As for the progress and future of her farm, Erin says she has been humbled and enlightened by the farming process. Coming from an academic background, she says that the biggest initial shock to her was the difference between theory and practice, something that farming really helped to put into perspective. She still maintains her artistic streak though, saying that farming is just a new art form to her, and Erin’s efforts and participation in bringing “articulture” to New Harmony Farm is evidence of this. A future idea for “articulture” she has had is to paint a tree with some form of bacteria like a yogurt, and to watch as the bacteria changes colors and evolves. With her farm becoming more stable each year, Erin says that she hopes to make people more conscious of the food they eat and how farming can be improved. “Our stomachs are a great place to start,” she says. Learn more about Erin’s farm at www.newharmonyfarm.com.